The scene at the shop on Thursday night. 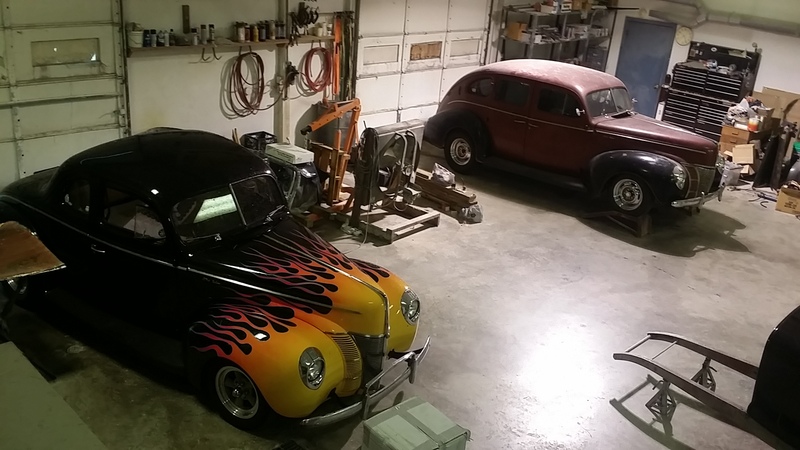 The coupe made the trip down to the shop, and the rain storm hit, so I pulled it inside. Couldn’t resist taking the picture from up the stairs. 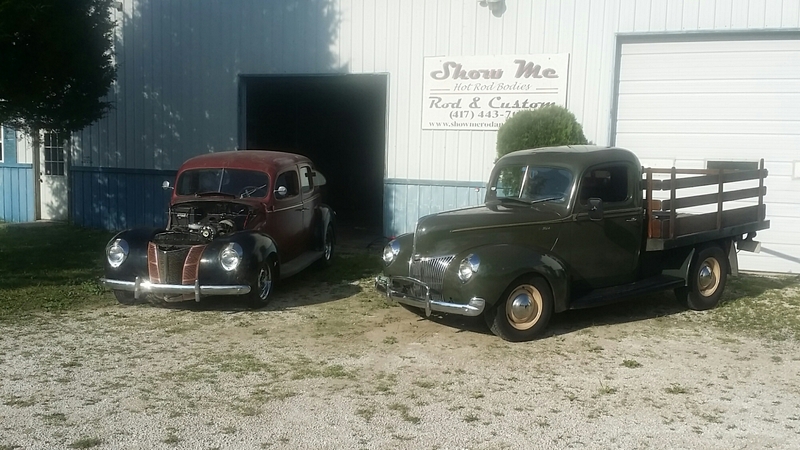 Man, it’s been some busy few days on the ’40 sedan. 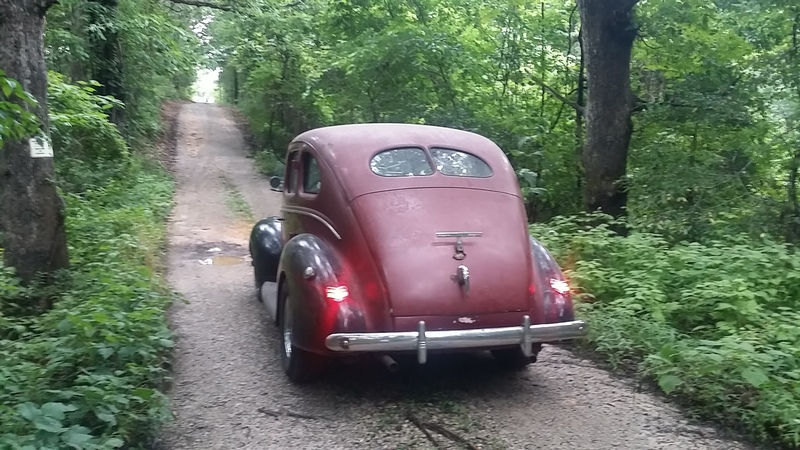 Ok…It’s been a pretty busy past 36 days, from when we moved the car over into the shop, on Memorial day, until yesterday, July 4, also known as Independence day. Thursday night: I went down to the shop and pulled out the front spring, un-reversed the eyes on the main leaf, reassembled it, and put it back under the car. I had to do this because there was not enough clearance between the driver’s side wishbone and the steering box. Gained about an inch of clearance, so it was worth it. Friday Afternoon/Evening: Spent time wiring the lights. Got the headlamps working, high and low beams, and then got distracted by the Holley Carb, which has a blockage in it somewhere. Pulled fuel lines loose, and determined that the pump was fine, the fuel lines were fine, and the filters were not clogged. Saturday: Pulled the Holley back apart, blew carb cleaner through all the jets and such, re-installed it. No success. Pulled an old Carter AFB off of Doug’s shelf, bolted it on, and BINGO! Worked like a champ. Done with that distraction! Finished up wiring the rear lights, with turn signals and hazard flashers. Also rerouted the transmission cooler lines and installed a new transmission cooler. About a mile to the west of the shop, I stopped at the Baptist church for a photo. Monday Morning: After a meeting with the missus, and getting my “honey-do” assignments for the holiday, I decided to R-U-N-N-O-F-T to the shop, with some shock absorbers and mounting studs for the rear end. Got those installed, adjusted the rear brakes, re-bled the rear brakes, and topped off the brake fluid. 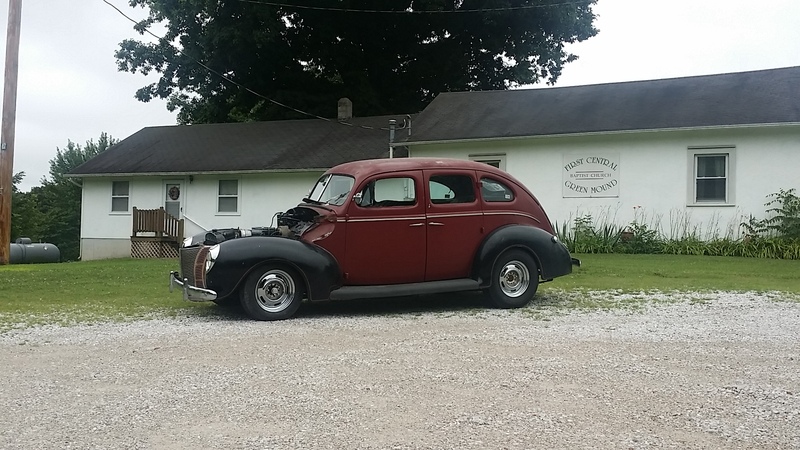 Took the car for a test run back by the Baptist church, then felt adventurous and ran about a mile down Highway 65, getting the car up to about 70, at one point. Since I ran out of time, I went back to the house, at the agreed upon time, and took care of the “honey-do’s”. 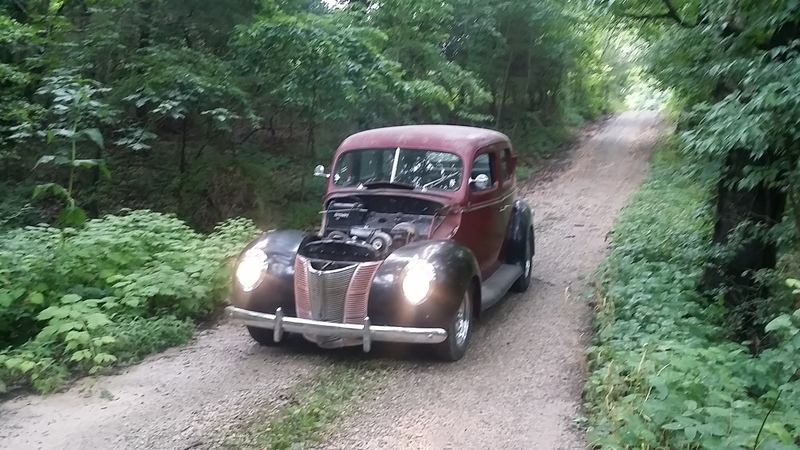 Monday Evening: After getting my chores done, I got a wild hair and jumped in the ’40 stake truck and headed back down to the shop, armed with the battery from the coupe, a screwdriver, a garage door opener, and a bottle of water. Being the cheap guy that I am, and trying to get this thing on the road within a tight budget, I haven’t taken the money to buy a battery for it yet. LOL I put the battery in the sedan, pulled it out, took the gratuitous photo above, moved vehicles around, and drove the sedan 23 miles back to the house. I’m sure I violated the noise ordinances in all the towns between shop and my house, but it was fun. The car did great, with good oil pressure, and the temp gauge never got above 170 degrees. Hoping that I can run it over to the exhaust shop tomorrow, to get the exhaust re-routed, and tame the noise.